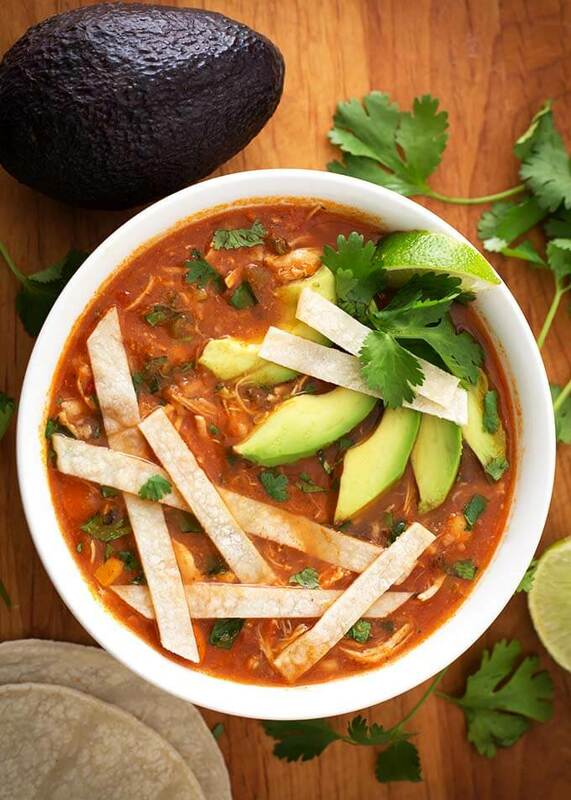 Instant Pot Chicken Tortilla Soup is a delicious, flavorful Mexican soup. If you haven’t had a tortilla soup before, the spices, herbs, and corn tortillas give this Pressure Cooker Chicken Tortilla soup a wonderful fiesta of flavor and texture! 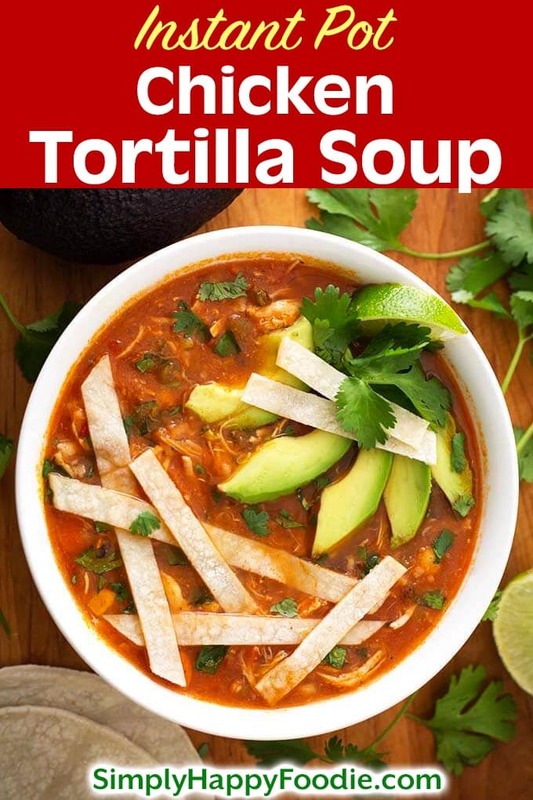 If you enjoy flavorful Mexican food like tacos, carnitas, and such, you will like this yummy pressure cooker chicken tortilla soup! There is a lot of flavor packed into this soup. This is a very easy soup to make in your electric pressure cooker. Using the sauté function is one of my favorite things about the Instant Pot. You will just sauté the veggies in the pot, then add all of the other ingredients except for the corn and the tortillas. Then pressure cook it and finish it up. Soups are my favorite meal to make in the Instant Pot pressure cooker. I have over 50 soups on this website! Just do a search and you will find some of the most delicious Instant Pot Soup recipes out there! 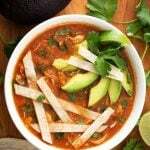 Instant Pot Chicken Tortilla Soup is a very flavorful Mexican soup. If you haven't had a tortilla soup before, the spices, herbs, and corn tortillas give this Pressure Cooker Chicken Tortilla soup a wonderful fiesta of flavor! Add onions, celery, carrots, and bay leaf. Cook until vegetables are tender, stirring occasionally. Add the jalapeño, and garlic. Cook, stirring constantly, for 30 seconds. Add the tomatoes, cumin, chili powder, coriander powder, smoked paprika, salt, pepper, and oregano. Stir. Add the black beans, broth, and the chicken. Stir. Add the tomato paste but do not stir. Place the lid on the pot and set the Steam Release Knob to Sealing position. Press the Pressure Cook (or Manual) button, or dial on Ultra. Set time to 10 minutes using the + or - button, or dial. When cook cycle ends, let pot naturally release pressure for 10 minutes. Then manually release the remaining pressure by turning the knob to Venting (or push the button on the Ultra). When the pin in the lid drops. Give the pot a gentle shake to remove steam pockets. Open and stir the soup. Taste and adjust salt, if needed. Remove chicken with tongs and place in a bowl. Stir the corn and tortillas into the soup. Shred the chicken using two forks. Then add back into the soup. Put the lid back on (leave vent open) and let it sit while you get everything else ready. This gives the tortillas a few more minutes to dissolve a little. This tortilla soup is so good! We atr the whole pot in one day! Thank you for this great recipe! That’s great, Katie! Thank you, I’m so happy you liked it! This was the second recipe I made in the IP. (The first was your chicken/spinach/gnocchi soup.) This went perfectly and the flavor was amazing. It was SO easy. THANK YOU! That’s great, Amy! Thank you for your review!